Colton the former NFL playing virgin is The Bachelor! I point out the virgin thing because it's apparently the crux of the entire season to get this guy laid - oh, and to find true love. The show knows we care so little for him that in the first 30 minutes his only appearance is in a framed photo. 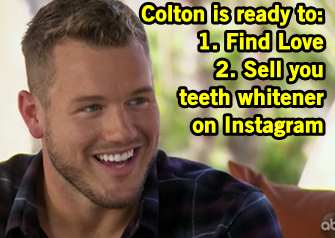 Instead, the show introduces many of his future girlfriends who all talk about Colton's virginity because again, there is literally nothing else about him. Eventually, we watch him parade around in many shirtless activities and acknowledges none of us wanted to see him as The Bachelor. But he apparently really fell in love last time and is ready to find his life partner on this show. After an additional 25 minutes of filler content of franchise alumni, fan parties, and randos getting engaged, the show actually begins. I already hate this season. The limos finally pull up and, of course, the first girl out throws out a virginity joke because, again, nothing else of interest. Most of the other girls give their standard greetings to make them not be total tools on TV, but there's always the exception. Caitlin makes him pop a balloon AKA a cherry, Courtney makes him each her peach, and Katie takes his V-card. Alex D takes her "Colton takes it slow" pun to the next level by dressing as a sloth and it's the only virginity joke I can tolerate because the costume distracted me. Hannah G gifts Colton with his favorite underwear: an empty box because he wears none. Heyo, freeballin! Tracy the wardrobe stylist arrives in a cop car as fashion police and it's so forced that I can't even. Some girls bust out second languages, but Bri stands out with her Australian accent - which is totally fake as a way to stand out. Erin, whose career is "Cinderella" apparently, arrives in a carriage and leaves her shoe behind. And Catherine brings her dog Lucy because I'm guessing she couldn't afford a longterm dog sitter. Colton comes inside and gives a speech about being ready and excited for "all of this" and I'm glad one person feels that way. He gets one normal conversation before getting the "Why are you a virgin?" question (his personal life took a backseat for his career and he's waiting for the right person/moment) Then it's back to bonding and he shares his first kiss of the season with Miss North Carolina Caelynn. Catherine the dog girl interrupts women two times, gets a light scolding from Onyeka who tells her to chill, so Catherine interrupts another time. Content creator Hannah G in her shimmering gown gets the first impression rose for reminding Colton of home. Honestly guys, I paid maybe 35% attention to this and I know I should be recapping legit but like, this is basically a journal about reality TV and I make about $100 every 7 years from the blog so I'll say what I feel like. This is my Bachelor downward spiral. At the Rose Ceremony, Colton gives out a bunch of roses and the last rose goes to "fourth time's a charm" interrupter Catherine. 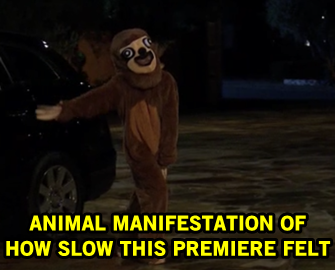 Colton cuts a lot of girls I don't remember but one is the sloth so guess she'll always have that onesie. I'd much rather have that onesie than Colton, TBH. Fingers crossed this season improves because lords and ladies, that was a painful three hours. My gf and I missed half of it, which is to say we missed none of it. hes so unremarkable and boring but I like they shaded Sean Lowe by saying hes the first virgin bachelor.